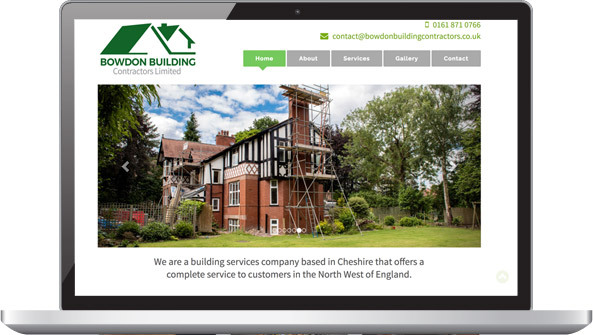 Bowdon Building Contractors are a building services company based in Cheshire that offers a complete service to customers in the North West of England. They are a family-owned business with a reputation for providing high levels of service and quality workmanship. All their workforce are time-served craftsmen, with decades of experience. They take an ‘old-fashioned’ pride in their work and aim to get the job done right first time, every time. 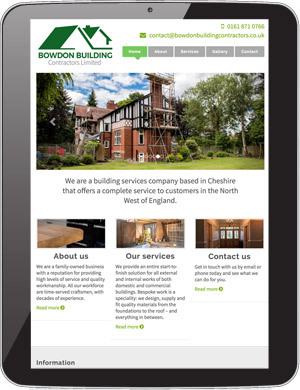 A new business run by time-served craftsmen with decades of experience, Bowdon Building Contractors needed branding and a company website. The website had to convey professionalism and trust, and be easy to update. I worked with the business partners to design and develop their company brand and their website. It was agreed that professional photography would be a key factor in showing potential new customers the quality of the company’s work. I worked with a photographer onsite to produce a wonderful range of images, many of which we used on the website. This page took 0.913 seconds of computer labour to produce. No computers were harmed in the making of this page.